Today’s Flash Back Friday comes from June 2012. Human domestication from a less natural diet and lifestyle has slowly but surely led to degeneration of our species. Jason Hartman is joined by Daniel Vitalis, health and nutrition specialist, for a discussion of getting back to the “wild,” understanding the effect of our processed and hybrid foods, and learning how wild plants are medicinal and healthier for a long and healthy life. Daniel explains that the domestic foods have been designed to be more palatable, while wild foods tend to be bitter. He gives a history lesson on bananas, which were originally full of seeds, less fleshy, and very small, needing to be cooked to be eaten. The yellow banana that we consume today came about in the 1800’s. As an illustrative example of mutated domestication, he points out that all of the dogs we have today came from the gray wolf, which is the same mutation process that has happened with food, called GMOs. Daniel encourages travel and acclimating to other temperatures, foods and water to make the body stronger. This influence on your body through environment is called epigenetics, making body changes at the genetic level. Daniel explains that people think degenerative diseases are happening because we’re living longer today, but this is a misnomer. Our bodies began premature degeneration around 10,000 years ago when farming began. This is when arthritis and cavities first began to appear. Indigenous people and wild animals do not suffer the same degenerative processes as domesticated people and animals and this is due to the difference in diet and how they live with the environment. Compact cities and urban communities have been a feeding ground for disease, and the main cure for such diseases as polio were from the introduction of plumbing more than from vaccines. Daniel emphasizes that the interaction with natural soil and landscapes provides immunity and a strong sense of wellbeing, reducing the need for manmade medicines. 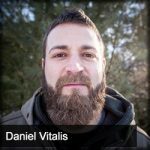 Daniel Vitalis is a Leading Health, Nutrition, and Personal Development Strategist as well as a Nature Based Philosopher. He teaches that our Invincible Health is a product of living in alignment with our biological design and our role in the ecosystem.